4월 16일의 약속 국민연대(4.16연대)는 지난 4월 16일, 4월 18일, 5월 1일에 있었던 세월호 집회 중 경찰의 과도한 공권력 사용으로 인해 심각한 인권 침해가 발생한 것과 관련하여 『평화로운 집회결사의 자유 유엔 특별보고관』, 『인권옹호자 유엔 특별보고관』, 『의사표현의 자유 유엔 특별보고관』, 『진실과 정의 그리고 재발방지에 관한 유엔 특별보고관』들에게 긴급청원을 제출했습니다. 4.16연대는 긴급청원에서 세월호 집회 당시 벌어진 경찰의 과도한 공권력 행사와 그 과정으로 인한 유가족 및 시민들의 부상, 경찰 차벽으로 인한 이동권 제한, 인체에 유해한 최루액을 섞은 물대포 사용, 경찰의 불법 채증 사례 등을 유엔 특별보고관들에게 전달하였으며 이러한 과도한 공권력 투입이 집회 참가자들과 경찰 사이의 불필요한 갈등을 유발했다고 밝혔습니다. 또한 세월호 참사가 일어난 지 1년이 지난 오늘날까지 특별조사위원회의 독립적인 활동을 방해하려는 시도들로 인해 세월호 참사의 철저한 진상규명이 지체되고 있음을 지적하며 이는 유가족들과 시민들의 진실에 대한 권리를 침해하는 것이라고 강조했습니다. 유엔은 진실을 찾기 위해 피해자들에게 보장되어야 할 권리와 이에 대한 국가의 책임에 대해 오래 전부터 강조해오고 있습니다. 2005년도 유엔 인권위원회에서 발표된 ‘불처벌에 맞서기 위한 일련의 원칙(E/CN.4/2005/102/Add.1)’에서는 기억을 보존할 국가의 의무, 알 권리의 보장, 양도할 수 없는 진실에 대한 권리 등을 명시하고 있습니다. 또한 2013년 유엔 의사표현의 자유 특별보고관이 유엔 총회에 발표한 정보접근권에 대한 보고서(A/68/362)에서도 진실에 대한 권리와 정보접근권이 양분할 수 없는 권리임을 지적하며 정의를 되찾고 피해자들을 위한 개선책을 제공하며 치유와 화해를 장려하는 것이 중요함을 강조했습니다. 특히 심각한 인권 침해의 경우 정부는 피해자 가족들에게 뿐만 아니라 대중에게도 관련 정보를 공개해야 한다고 지적하고 있습니다. 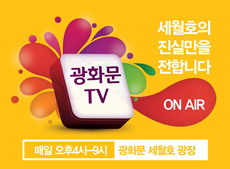 4.16연대는 앞으로도 세월호 집회와 관련하여 발생한 심각한 인권침해 상황을 지속적으로 유엔과 국제사회에 알리고 피해자 가족들과 시민들이 진실에 대한 권리를 비롯한 정당한 권리들을 자유롭게 누릴 수 있도록 연대해 나갈 것입니다. ** 유엔 특별보고관 긴급청원제도 (Urgent Appeal) 유엔 특별보고관 긴급청원제도는 심각한 인권 침해 사례가 발생했을 때 이를 해당 유엔 특별보고관에게 전달해 국가가 최대한 빨리 인권 침해상황을 조사하거나 이를 막기 위한 적절한 조치를 취하도록 하는 데 그 목적이 있다. 사례에 따라 유엔 특별보고관은 해당 정부에게 서한을 보내 관련 인권침해에 대한 내용을 확인하고 해당 인권침해를 최대한 빨리 중단할 것을 요청할 수 있다. 최근 유엔 특별보고관들은 밀양 송전탑 건설 과정에서의 인권침해, 강정 해군기지건설 과정에서의 인권침해, 전교조 법외노조화 등에 대해 한국 정부에 인권침해 내용을 확인하는 서한을 보낸 바 있다. During protests calling for a thorough and independent investigation of the Sewol ferry tragedy and the raise of the ferry, a number of human rights defenders including victims’ family members were arrested, detained and severely injured. The police used water cannon with harmful tear liquid towards human rights defenders and used bus barricade to block all the roads near the protest sites. Below urgent appeal specifically describe situation on 18 April 2015, but on 16 April and 1 May, similar violations happened. On 16 April 2015, 10 human rights defenders were arrested. On 18 April 2015, 100 human rights defenders were arrested including lawyers, journalists and religious leaders. On 1 May 2015, 42 people were arrested. As of 4 May 2015, four people are detained. 16 April 2015 marked the 1-year commemoration of the Sewol ferry tragedy, which claimed 304 lives. The families of victims and supportive people held nation-wide commemoration ceremonies on 16 and 18 April 2015, demanding a thorough and independent fact-finding of the truth behind the tragedy and the raise of the Sewol ferry. This urgent appeal covers comprehensive human rights violations by the police crackdown on the memorial service for the first anniversary of the Sewol ferry tragedy on 18 April 2015. On 18 April 2015, after the memorial serviceat Seoul City Hall Square, tens of thousands people marched about 500m to the Gwanghwamun Square where a group memorial altar was placed to offer flowers. However, they were stopped by thebus barricade of the police. 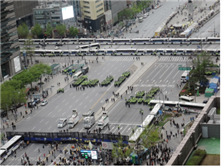 The police sealed off the Gyeongbok Palace, the Gwanghawmun Square, and the Sejong-ro Intersection with security cordons by disposing approximately 470 police buses including the specially designed 18 trucks, and security fences. In addition, a large police force of about 13,700 personnel from 172 units was mobilized for the crackdown. Sewol victims’ families and people have long demanded for their right to truth. They called for setting up an independent investigation committee to find out the truth of the Sewol ferry tragedy. They wanted to know whether their families could not be rescued, or were not rescued, why the ferry capsized, and who are responsible for the loss of their families. Unfortunately, the government tries to set up an investigation team(under the investigation committee) with majority members are public officials and also did not provide enough budgets, which will nullify independent works of the investigation committee. This clearly violates victims’ families right to truth. The barricade made by police buses on 16 April 2015. This police bus barricade totally blocked all the roads around the protest area. 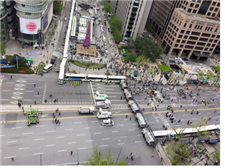 The families of the victims and people made a detour around the bus barricade to the Gwanghwamun Square, while some broke through the barricade and police line close to the Gwanghwamun Gate, but only to be stopped by another bus barricade. In the process, the police used massive water cannons containing capsaicin and tear liquidto protestors. This excessive use of force by the police provoked people and families of the victims. Importantly, every road and sidewalk leading to the Blue House (the presidential office) was blocked by the police, causing unnecessary conflicts. Moreover, the police’s inhuman treatment of the families of the victims such as isolating and physically assaulting them, and forbidding them from going out even for toilet, and its sudden arrest of some family members exacerbated the outrage of the protestors. A series of incidents occurring at the demonstration on 18 April should be understood as the accumulated anger and protest of people against the police’s responses up to date were expressed out. The police arrested 100 protestors including the victims’ family members (77 male and 23 female). Journalists, lawyers, religious leaders and even high school students were also among them. In addition, a number of people were injured and transferred to hospital. Among the 100 persons, the prosecution requested the arrest warrants for five persons (including lawyer Kwon Young-kook who was at the site as a member of the human rights violation monitoring group of lawyers) and the court issued the arrest warrants for two persons. Later, the Prosecutors office again requested detention warrant for two people whose detention warrants were denied by the court, and this time, court issued the detention warrants. Two detained people are active human rights defenders who are working at the People’s Committee for the Sewol Ferry Tragedy, which is a network consists of more than 800 South Korean NGOs. Five of the 100 persons arrested on 18 April were high school students (they were released on warning later). In the process of roundup, there were also a number of sexual harassments including a woman was taken with her top lifted up to her ribs. Many women were also excessively pulled by force with some cases of male police officers hauling female protestors in by pulling their pants. It is a clear violation of the regulation that a female police officer should be in charge of taking a female protestor in. 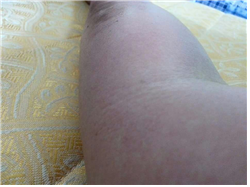 One human rights defender’ leg was swollen after he was shot by water cannon with tear liquid. This photo was taken after 1 May 2015 protest. This shows tear liquid mixed water in the water cannon was extremely harmful. On 18 April, as well as 16 April, the police installed bus barricades to stop people’s commemorative march. Every road and sidewalk leading to the Blue House was occupied by the police. Not only people who were heading to the Gwanghwamun Square to offer flowers to the victims of the Sewol ferry tragedy but also residents in the neighborhoods around the Gyeongbokgung Station and Anguk Station were not able to pass the sealed off streets or sidewalks. Exits of a few subway stations were also blocked, making general subway passengers unable to move in and out. Installing bus barricades and blockading subway exits are undermining the people’s right to move without any ground, therefore unconstitutional and unlawful. The Constitutional Court’s jurisprudence states that in case of restricting the fundamental right of freedom of assembly, the restriction should be minimum and limited only to one necessary to address individual illegal acts (the Constitutional Court decision, 2009 HeonMa 406). In addition, police blockade such as cordoning off with bus barricades should be imposed as the last resort only in cases when there is an urgent and clear danger unpreventable by prohibiting or dispersing individual assemblies. Even according to the Article 6 of the Act on the Performance of Duties by Police Officers which the police relies on for the grounds of bus barricades, for the prevention and control of assemblies by the police to be legitimate, “a criminal act is about to be committed in front of the police officer” and “urgent measure is needed for the reason that human life or body might be in danger on account of such action”. Moreover, Article 1 (2) of the same Act states that“the authority of a police officer prescribed by this Act, shall be limited to a minimum degree necessary for the officer to perform his duties, and shall not be abused”. The bus barricades and massive disposition of police force restricted the right to move of not only participants of the memorial service and demonstration, but also general passengers. The police did not even provide any information on detours, causing a lot of complaints. The police even used capsaicin sprayers to citizens who complained about every street blocked. When citizens tried to squeeze in between bus barricades at the Gwanghwamun Square, police officers sprayed capsaicin and used water cannons to stop them. Moreover, the police turned water cannon straight on the people, instead of firing at a high angle. Some people fell down due to high water pressure. The guideline for using water cannon, stating the direct fire of water cannon should aim down from chest level was not observed. Water cannons containing capsaicin and tear liquid were used for about 4 hours. Many citizens suffered pains on their eyes and face as well as difficulties in breathing. In addition, capsaicin sprayers aimed at face, making people unable to open eyes for minutes and suffer sores on eyes and face. There were also very dangerous moments that riot polices pushed the protestors hard with their riot shields when citizens were not able to move freely after capsaicin and tear liquid contained water cannon sprays in a row. The police treated the people marching to meet the families of the victims as potential criminals. Importantly, the director of the public security bureau of the Jongno Police Station (one of districts in Seoul) repeatedly blared orders to dissolve over a microphone and threatened the families of the victims and citizens of arresting them as flagrant offenders of disobeying the order of dissolution and of general obstruction of traffic after announcing the Miranda rule. It was late night with bad visibility and the riot police and protestors were at handgrips with one another. However, the police did not assure a safe distance. Although it is high ranking officers’ responsibility to refrain both protestors and riot polices from over-stimulated in close confrontational situations, the director in agitation incited further hostilities between protestors and police officers, which resulted in many police officers and protestors injured. The police officers disposed to control the assemblies did not wear any name badges withpersonal identifiable information, while there were flags identifying their unit. Therefore, it was not possible to establish identification of each police officer. Mr. Frank La Rue, a former Special Rapporteur on the Rights to Freedom of Opinion and Expression who officially visited Republic of Korea in 2010 expressed his concerns over that investigations of cases of excessive use of force is hindered by the fact that there are no visible name badges, identification numbers or other identifiable information on the uniform of riot police in his official report of his mission to the Republic of Korea to the UN Human Rights Council. The Korean National Police Agency reported to the human rights council that name badges will be pinned on every police uniform. However, the plan was yet to be implemented. At a press briefing on 19 April, the police said,“a number of illegal violent acts took place including occupying the streets for hours, physically assaulting police officers, and destroying police equipment”. It also expressed its plan to “take strict legal action against all those involved in waging illegal violent demonstrations”. In this regard, major civil and criminal legal actions are expected in the future. 입장 | tag: 416가족협의회, 416연대, 경찰, 긴급청원, 세월호, 세월호참사, 시행령 폐기, 안전사회, 유엔, 유엔 인권위원회, 유엔 특별보고관, 인권침해, 집회 | 2015/05/04 by 대책회의.